So you want to continue learning and growing in your knowledge scholastically, clinically, and personally? Two words: LIFELONG LEARNING. Lifelong learning goes beyond the context of school, way beyond the typical lecture-style learning, and means actively pursuing self-initiated learning projects. Lifelong learning encompasses a broad range of formal and informal learning in addition to the behaviors, attitudes, and knowledge we acquire during our daily experiences. Since we are occupational therapy practitioners, it’s quite lovely to know that our day-to-day occupations (or meaningful activities) contribute to our omnipresent opportunity to learn! Lifelong learning looks a little different for every therapist (and any healthcare worker for that matter). 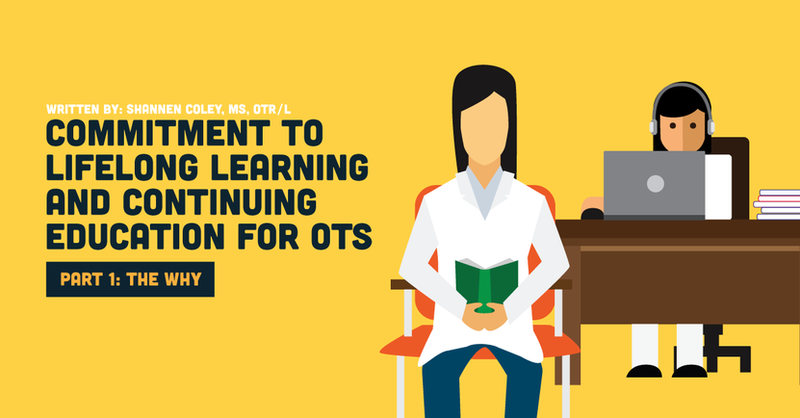 Whether you are a new grad working in a familiar inpatient rehab setting or working in an assistive technology/switch toy adapter/amazing tech-savvy role, each field within the occupational therapy profession will have new technologies, rules, regulations, and updated competencies that require continual retooling on the job. This is where the importance of lifelong learning comes into play. Now that we know a little about what lifelong learning is, let’s dive into 8 reasons why lifelong learning is essential! The day you stop learning is the day you start dying. As new grads we have the advantage of completing the most up to date training in preparation toward becoming skilled evidence-based practitioners. But the learning does not end after a diploma. New literature and evidence is published daily and covers topics we did not learn in school, which leads to a need for the commitment to seek more knowledge and clinical understanding in order to best serve our patients. The principles of lifelong learning entail an intrinsic voluntary desire to creatively learn. Topics that are not taught in formal environments are awaiting exploration in your journey toward self-actualization — which, like lifelong learning, has no true endpoint. First and foremost, just because you meet the qualifications and land an interview for your dream school or job, achieving that crucial acceptance or offer letter may require much, much more. In this era of advanced change, administrators or employers are highly interested in well-balanced individuals who demonstrate the aptitude and volition to learn and develop in multiple areas. Secondly, potential employers actually perceive your ability to self-reflect and determine you do not know something as a job trait that directly increases your competitiveness among other applicants for the sheer implications that you will be coachable and are willing to admit to failures. Dedicating a couple of hours a week to diving into new ideas and exploring evidence-based interventions (hello continuing education — more on this in Part 2!) requires commitment and time sacrifice of more mindless tasks. Take a moment and picture OT/OTA school as a gym membership and your professors as your personal trainers who guide you to reach your scholastic goals, much like a personal trainer guides you to reach your fitness goals. Neither the professors or personal trainers can complete the work for you to achieve your desired outcome. Moreover, in school we are provided with resources to help us reach a pretty standard goal: graduation, pass boards, become entry-level certified, and begin our careers — all of which require self-discipline. Lifelong learning requires this self-discipline skill to a greater extent and is more than meeting objectives on your syllabi. The extra sweat equity and time you carve out to build your skill sets, the higher likelihood of growth, satisfaction, and reflection. When you feel competent in your work environment yet still feel challenged, odds are you will be happier than your fellow colleague who performs the same boring, repetitive, routine interventions day after day to every patient on their caseload in spite of the variety of diagnoses and levels of assistance needed per patient. Challenging yourself to learn something out of your norm or engaging in enriching experiences are assets of lifelong learning that can directly reduce your risk of dreaded burnout. When workplace changes occur (changes in management or productivity requirements, etc) remember that you are able to embrace change and adapt to new roles! Learning for the sake of learning leads to the freedom to take up new interests or hobbies to enhance your life. When you cultivate your mind with new skills, new foundations, and new thoughts, you are stimulating your brain to be the sponge that it is and wants to be, allowing it to absorb, sort, and piece together new ideas with old concepts leading to greater overall satisfaction. Skill sets change how an individual reacts to situational experiences. An active mind improves our ability to adapt to change and generalize skills learned to combating stressors in life, directly improving quality of life by giving purpose to a state of mind. The wisdom we gather from turning our trials to triumphs can be translated to real value that can act as a tangible benefit for others. Upgrade ya (cue Beyonce)!! Can y’all remember when it was “cool” to have a flip phone? Yeah, it’s been awhile. There is a push for constant upgrading due to an immense growth in technological advancement around the globe. If we want to cope and succeed in our private and work life, it is imperative to open our willingness to the modern life. In conclusion, lifelong learning is not going to become less important anytime soon. We have the obligation to ourselves as a community of up and coming practitioners to commit to learning throughout our lifetimes for the benefit of our patients, peers, and our personal well-being. Next up, we will divulge into “How” in effort to clearly articulate how to complete the next steps on your journey. Picture exploring different passions, seeking speciality certifications, achieving AOTA digital badges, navigating different continuing education sites such as MedBridge . . . also, GIFs and lots of them, and maybe even a MedBridge discount code . . .